When 2,3-bisphophoglycerate (2,3-BPG) binds to haemoglobin, a higher partial pressure of oxygen is needed to bring about 50% saturation of with oxygen. What is the physiological significance of this and its molecular basis? How would this affect the oxygen dissociation curve of haemoglobin and would it alter the Bohr effect? In its original form this was a multiple choice question that had remained unanswered for a year, possibly because the detractors are very bad. Because the topic it covers is thought to be of general interest it has been reformulated as a standard question. For the record, the original question asked which of the following were correct: (1) 2,3-BPG in red blood cells causes the oxygen dissociation curve to shift to the left. (2) The binding of 2,3-BPG to haemoglobin lowers the affinity of the haemoglobin for oxygen. (3) Binding of 2,3-BPG to haemoglobin reduces the Bohr effect. (4) When 2,3-BPG is absent, oxy-haemoglobin is less likely to unload oxygen. The ‘correct’ answer was given as (2), but the poster thought that (4) was also correct. The oxygen dissociation curve for haemoglobin (Hb) in the absence and presence of 2,3-BPG is shown in (i) below: It can seen that the curve has shifted to the right (MC-1 incorrect) and the oxygen affinity is obviously decreased, as it takes a higher concentration (pressure) of oxygen to achieve the same percentage saturation (MC-2 correct — and so is option MC-4 as far as I and @JM97 can see, agreeing with the poster. MCQs are an educational abomination!). The physiological significance of this is considered in detail in my answer to another question, but, in short, it ensures that an adequate proportion of the (smaller) amount oxygen taken up at the lower pressure in the lungs is released in the tissues (3 minus 4, cf. 1ʹ minus 2). To address the interaction between the effect of 2,3-BPG and the Bohr Effect one needs to consider the corresponding curves for the effect of hydrogen ions (falling pH), shown in (ii), above (see also my detailed answer to this question). It can be seen that the effect of hydrogen ions is similar to that of 2,3-BPG. Can these two have independent (additive) effects? 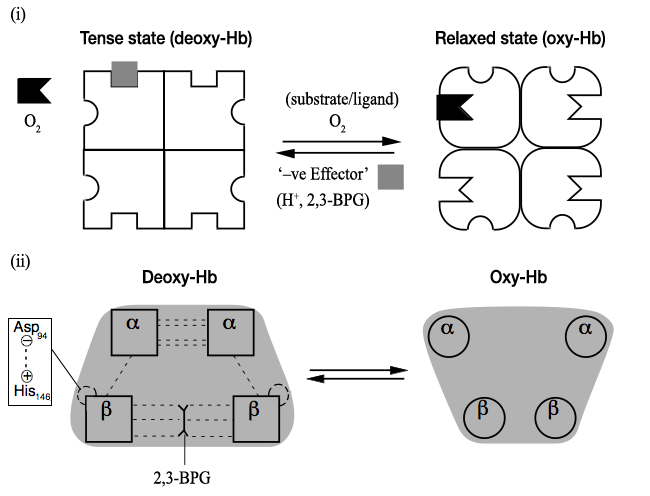 It is known from molecular studies that they both interact with and stabilize deoxy-haemoglobin at different positions (see ii, below), and in one model of the allosteric mechanism they can be considered as shifting the equilibrium from the tense (deoxy-) to the relaxed (oxy-) state of haemoglobin: (i) Generalized diagram of allosteric equilibrium of tetrameric protein between relaxed state (where it can bind substrate/ligand) and tense state. Negative effectors favour the tense state. (ii) Illustration of this for haemoglobin, where H+ ions protonate His-146 of the β-subunits and 2,3-BPG forms ionic bridges between the two β-subunits. Not the answer you're looking for? Browse other questions tagged human-biology proteins hematology haemoglobin or ask your own question. Why isn’t Haemoglobin a plasma protein, rather than being encompassed by the erythrocyte? How does 2,3 biphosphoglycerate works to release oxygen bound to the hemoglobin? What are the clotting factors' effect on avascular necrosis development? What Effect would Cannabinoids have on the Acute Porphyrias? In which of the following diseases structure of haemoglobin produced is normal but their amount reduced?